Carex Acutiformis, a variety from Europe used to decorate gardens and ponds. e found throughout the world, often as components of marshy habitats. There are roughly 1,000 species, of which a limited number are used locally as food or bedding for animals and a few are cultivated as ornamental “grasses” for gardens. Difficult to identify and very site-specific, those of us working in Rural System see the very precise site requirements for Carex species as an open door to potential plant observations and confirmation, rather than a discovery operation, by finding the multi-factored sites of these frail animal-food sources. 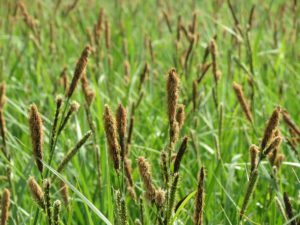 Carex species are food sources considered too small and too similar and too site-specific to rank with other species, ¬where farmers (rarely “range managers”) intently study profits from “grassland-like” plants. The Carex are too easily lumped as “grasses.” I’ve had the pleasure (in approximately 1954) of being taught the diverse characteristics of these grass-like plants. I now think that with improved herbaria of the state and region (USA), new GIS site characterization, and with new imperatives for productive human-food sources from despoiled farm and mined lands of the Virginia rural areas, a meaningful, profitable, site-specific, Carex-forage production system can be created for now and the emerging faunal-future, with domestic and wild-fauna uses. Carex stricta, a variety found throughout the Eastern United States along bodies of water. I now imagine improved education of staff, learning about the Virginia Carex species with vastly-improved illustrations, naming the plant parts and their seasonal appearance. With education, they can achieve reduced intermixing of “just grass,” site-selection for seeding and care-to-meet-needs, and directed analyses of animal production per unit area of animal forage—invested to meet specific-animal productivity. We know that the Carex are similar to grasses, were evaluated as being of higher protein value than blue grasses, but were ignored or discounted in the past due to their specific habitat requirements. We hypothesize we can now contest with those specific habitat requirements, with local selections, GIS-based site-selection, and quality-specific uses and results-analyses. “They, these little grasses, are ‘very-site-specific,’” says the range manager. And so are we, within Rural System. We can improve seed-source selection and make very site-specific selections to achieve intensive, cumulative, very-real, net-valued grassland management of Rural System tracts for superior forage. Much of Rural System’s superior forage would be directed at goat systems (having notably high palatability differences among Carex species) for human-youth health gains, as a currently-specific market. We now see precisely, as if through a macroscope, a way to develop Carex centers throughout Virginia’s rural lands, create a high-quality forage specialty with great sales appeal, and work with a regional Carex organization, formed to bring raw botanical complexity and unique applications and developments on managed rural lands, to bear profitable, lasting, diverse gains for people. A staff can be built readily, within PowerPlace of Rural System, to develop a new resource under-foot for region-wide use and development… just some old non-grass patches! For the future, food scarcity and crop growth will become an increasing concern. Feeding livestock with alternates to standard grasses, especially those higher in nutrient density that take up fewer resources per square acre to grow, will become a primary solution. If we are to keep meat on the menu, we have to invest in these plans sooner rather than later. Allaby, M. (Ed.). ( 2012). A Dictionary of Plant Sciences (3rd ed.). Oxford University Press. F.J. Hermann, 19760, 65, 68, Notes on Rocky Mt. Carices. Rhodora 70. 419-421. Lewis, M.E. 1958. Carex- its distribution and importance in Utah. Brigham Young Univ., Sci. Bull. Biological Ser. I, No.2. Provo, Utah. 43 sp. How could there be so much waste within the food industry and what can we do about it? The report “Wasted: How America Is Losing Up to 40 Percent of Its Food from Farm to Fork to Landfill goes into great detail analyzing each segment of the food supply chain. I’ll hit the highlights but I encourage you to read the full study which is very well-written and easily digested by any reader. I summarized the major facts in Waste Not, Want Not but wanted to share more on the types of loss and possible solutions at each step in the food supply chain. The report behind the post Waste Not, Want Not is both upsetting and exciting. On the one hand you have a very real, very depressing situation in America where we lose 40% of the food we grow and people are legitimately going hungry. On the other hand, knowing this problem exists and knowing there are solutions to reduce such waste is exciting because there are great possibilities for innovation within the food industry. The problems are known and the solutions are attainable. As well such innovation is favorable to nonprofits, governments, and businesses alike. Reducing waste saves money so improvements are likely to be widely accepted. I’d heard Dr. Giles mention how his plans for the proposed Rural System could improve efficiency so I decided to revisit the topic with him. Me: Dr. Giles, I recently shared with you the report on food waste in America which you felt was disappointing though not surprising since you were already aware of the need for reducing waste. Can you tell me again how Rural System proposes to improve on this problem? This American idiom literally means that if you do not waste anything, you will have enough. In the US 49 million Americans (that’s 1 in 6) struggle with food security, and millions more suffer from the lack of quality, healthy food. The problem is not in our food production. We grow enough food to feed our citizens but according to a recent report, America is losing up to 40% of its food from farm to fork to landfill. We are wasting and we are left wanting. If you are skeptic about this number, please check out the statements from the USDA supporting these findings and their associated initiative, the US Food Waste Challenge. 40% of food in the US goes uneaten, equivalent to 20lbs of food per person, per month. Getting food to our tables eats up 10% of the total US energy budget, uses 50% of US land, and swallows 80% of freshwater consumed in the US. Food saved by reducing losses by just 15 percent could feed more than 25 million Americans every year.